Sandwell and West Birmingham Hospital has a bed base of 850 patients and employs 7,500 people. It also has 38,000 admissions each year, go which one in three patients have diabetes and a third are insulin treated. NaDIA data in 2015/2016 highlighted poor hypoglycemia management in the Trust despite an overall improvement in hypoglycaemia elsewhere in UK. According to a recent survey staff knowledge is poor in the hospital showing only 20 per cent were aware of the Trust’s hypoglycemia guidelines and only 30 per cent were ‘somewhat confinement’ in managing hypoglycaemia. Inpatient hypoglycaemic events are now targeted and promptly reviewed through the daily “hypoglycaemia email alert” system as a standard now. Specific education sessions are being delivered to such ‘hot spot’ wards. A new Think Glucose (TG) hypoglycaemia (induced by insulin/SU) prompt tick box check has also been developed for hypoglycaemia detection and action during TG referral. A monthly junior doctor insulin error/hypoglycaemia alert through hospital IT system SAFEGUARD now mandates all error discussions with their Educational Supervisors helping them reflect and learn from mistakes. We have seen a reduction in number of incidents already – 42 incidents recorded in 2015 and down to 34 in 2016 and 17 so far in 2017. 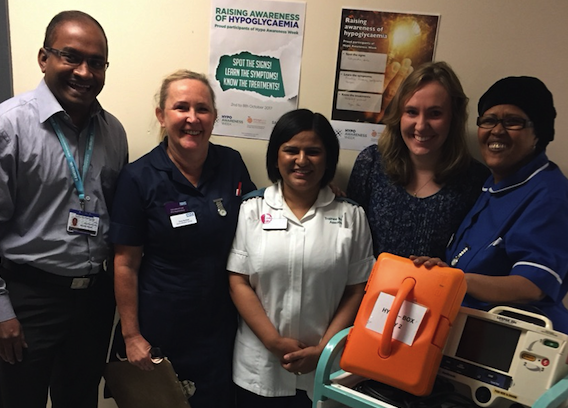 They secured funding of 5K from the Trust charity for new hypo boxes and contents (as per JBDS) to be made available on ALL wards to be kept on the resuscitation trolley. The hypoglycemia guideline has also been updated and simplified. The “6 steps to Insulin safety” online module uptake and feedback: all staff can access this module through the local Trust intranet on QUEST and are regularly being encouraged to do so. The DiSNs are currently targeting wards with high insulin incidents and encouraging staff to complete the module (> 300 have completed the module so far with good feedback). All Junior Doctors are taught this module on their mandatory teaching days. On-going hypoglycaemia audit and Diabetes Accreditation of wards (see photo) for every ward who achieve all four measures – hypo box checked daily on resus trolley, TG champion identification on every ward, > 90 per cent completed online six steps to insulin safety training and reduction in hypoglycaemia and insulin error. Sent out an internal staff communication email about hypoglycaemia awareness week to the entire Trust to raise awareness (see attachment). Arranged for a hypo awareness screen saver on every computer in the Trust to reach out to all about the importance of this week. Had photos taken with the Think Glucose Champions on wards and with patients in diabetes clinics on both sites of the Trust wearing hypo t-shirts. Live tweet across social media from the diabetic clinic on 5th October about hypoglycaemia explaining the condition including the dos and don’ts. Posted a short video about hypoglycemia on Facebook. Written a short review article on hypoglycemia for local press and hospital Heartbeat magazine.